I’m not sure if the Q&A on the RIDOT blog is a new feature, or something I’ve missed, but I read this item on April Fool’s Day and have to respond. A commuter writes in to complain about the light at the top of the Dean Street ramp off the 6/10 Connector. The writer states that the light is remaining green for Dean Street even when no traffic is on Dean Street and the ramp traffic then backs up. A: The traffic signal delays you experienced were due to the installation of new traffic signals. Once the project was completed and the vehicle detection function became operational, the department was able to fine tune and coordinate these two closely spaced traffic signals. The volume of traffic that uses these intersections during the peak hours, however, may push the limits of the existing road’s capacity. Widening the bridge over Routes 6 and 10 and thereby providing more lanes along Dean Street would alleviate the congestion, but is unlikely to occur because of the department’s limited economic resources. The nightmare that is the Dean Street Viaduct aside, RIDOT apparently has not heard of induced demand. Induced demand is the if you build it, they will of highway building. When capacity is added to a roadway, more people use it and fill the capacity, returning the road to the state it was that prompted the original increase in capacity. The current configuration of the Dean Street Viaduct is actually overbuilt aside from peak travel times, its 4 lanes filling only at rush hours and reverting to a desolate speedway the rest of the time. It is like building a parking lot for Christmas Eve shoppers, that sits largely empty the rest of the year. Actually, a better use of RIDOT’s limited funds, were they to choose to address morning congestion at the Dean Street interchange, would be some of the improvements we outlined in our REBOOT of Dean Street. From my personal observation in the morning, much of the traffic comes off the ramp, onto Dean, then left onto Atwells. That traffic is heading toward Downtown. Aligning the ramp from 6/10 with West Exchange Street would allow that traffic to flow through the intersection towards Downtown without having to flow through Dean and Atwells. Traffic turning left (heading north toward Smith Hill) benefits from no longer having to wait for the offset West Exchange light. The real way to reduce congestion is to reduce demand. There are both carrot and stick approaches to reducing demand. Sticks include tolls, higher taxes on gas and cars, allowing congestion to increase until the personal cost (how much value a commuter attaches to their time stuck in traffic) becomes too high, etc. and of course carrots can include better mass transit options, inducements for carpooling, off-peak toll discounts, etc. Trying to figure out where all those people using the Dean Street ramp off the 6/10 connector are coming from and where they’re trying to get to would allow us to begin to plan for a mass transit carrot to get them off the road. I’ve heard RIDOT Director Michael Lewis say more than once, “We can’t build our way out of highway congestion.” It would be nice if everyone else at RIDOT got that message. I find it frustrating that us lay-people appear to read more about traffic theory than those hired to implement it. Maybe Director Lewis – he is the Director after all – is not an effective leader of his Department if they aren’t getting his message. I truly believe that Dean street needs to become more walkable and bikeable. One of my biggest disincentives to riding or walking to work is that I have to go on Dean St., and in particular over the 6/10 bridge. It is a nightmare, and so I have the choice going a much longer way (which is good for the lungs but bad for the whole \”get to work on time\” thing), or drive. I also watch every afternoon as school kids navigate the corridor – barely escaping as they scuttle past the two exit ramps which interrupt the mangy sidewalk. (Who the heck thought the sidewalk should be on the side with exit ramps????) The \”reboot\” proposal looks like it makes good steps towards this goal, along with improving the traffic and opening space for development. Your proposal for Dean Street seems like it was well thought out and could potentially solve a lot of problems that currently exist in the area, but if the solution is not developed in collaboration with the involved stakeholders, the community who live in the area, the business and property owners and the people who can make the decisions (RIDOT and Providence), then it is practically useless. I’m sure you know that once someone has made their way in to state (and sometimes city) government it is almost impossible to push them out, even when their ideas are outdated. 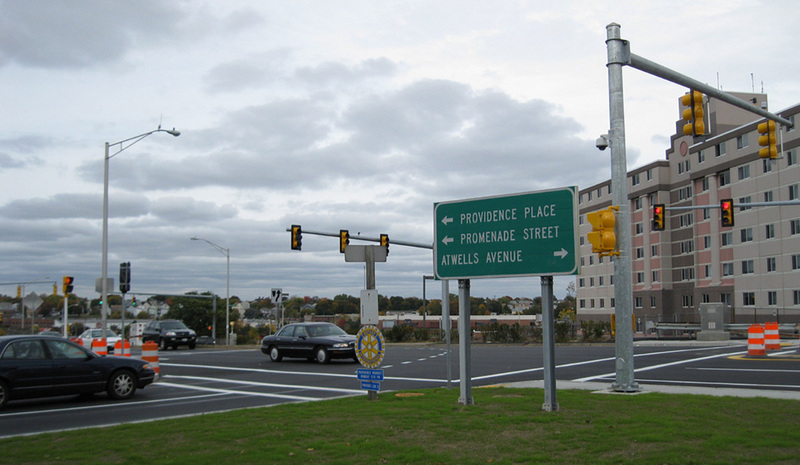 If transportation and urban planning mean so much to you, why don’t you go work for the state or the City of Providence and try to make change instead of just writing about it? The tide is changing at the state level, even if it doesn’t appear to be doing so, it just takes time for the bureaucracy to let it happen. “Induced demand” follows the idea of “triple convergence”, which means that when congestion is reduced on a certain roadway, it will fill right back up again in the future because people will shift their route, their mode and their time of travel now that the road is uncongested. The problem is, sometimes it takes 10 years for triple convergence to fully take effect so people (and therefore DOT’s) see widening improvements as viable. Nobody is looking at the larger picture. Craig, I work in Elmhurst, and when I used to live on Federal Hill (right by Dean St), I would either drive or take the bus to work (which was only 1.5 miles away). I had 2 choices for biking/walking… Dean St or going down Atwells to Eagle St to Valley St and up the huge hill on River Ave. Neither option seemed worthwhile. If Dean St went on a diet it would be a whole lot nicer. I wouldn’t mind seeing a bus use it either because the only way from where I lived to Elmhurst was to take the bus downtown and then either the 57 or 55.